Peaches, I love you. Summer wouldn't be the same without your soft skin that looks like it might burst at the peak of ripeness. When I take a bite, your juice drips down my chin in to my napkin-wielding hand. Just eating you whole is good enough for me, but what you add to summer meals is simply ambrosial. Summer goes hand in hand with fresh produce. Tomatoes, berries, citrus, and stone fruits are gathered like jewels, piled high on counters, and eaten by the handful. When I throw a party in the melting summer heat I do my best to take advantage of the bounty and keep the stove in the off position. Cold Gazpacho is a must. Traditional tomato gazpacho is an amazing treat, but if your find yourself already serving caprese salad or garlicky bruschetta, try making this refreshing and surprisingly savory version made with, you guessed it, peaches. I got the idea from a blog I love, Savory Simple. Her original recipe is fantastic, but I added Serrano peppers for heat, breadcrumbs for body, and a tomato or two for an added bite of acidity. 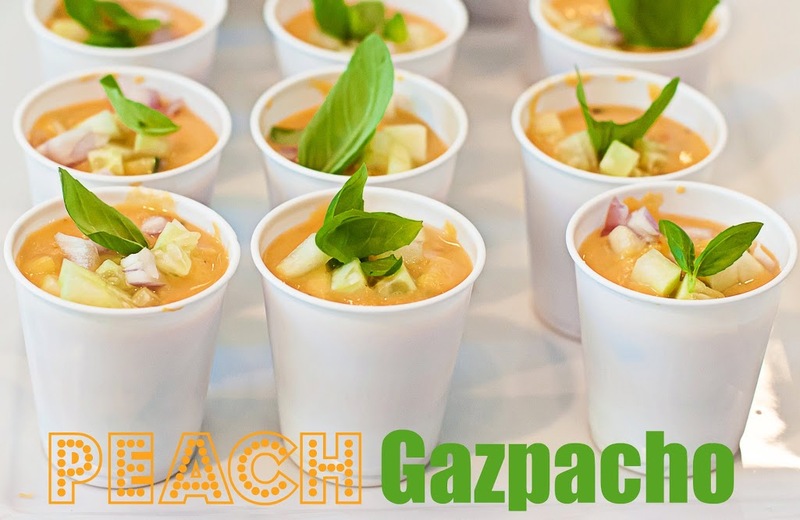 Peach gazpacho is a perfect first course, or serve in shot glasses as shooters at your next cocktail party. Maybe it will inspire you to start your very own summer romance with the lovely southern peach. Combine peeled peaches, tomato, bread, vinegar, olive oil, and garlic in a blender until smooth. In a food processor, pulse peppers, cucumber, shallot until finely chopped. In a large bowl, combine blended ingredients with chopped ingredients. Toss in shredded basil, and season with salt and pepper to taste. Cover and chill for 2-4 hours to develop flavors. Serve chilled in stemless wine glasses or shot glasses. Garnish with shallot, cucumber, fresh basil leaf, and a drizzle of olive oil. What a great idea!! They look terrific. I love, love, love peach gazpacho! The one I make I use serranos and cucumber too... and goat cheese. It's past time for me to make that again. I am one of those few and crazy people who actually isn't a huge peach fan, but that said this actually looks really, really good to me - I think you won me over with the Serrano peppers!